Elpeus Technology offers a complete line of Fibre Channel interconnect products including the QSFP, SFP+, HSSDC2, HSSDC, SFP and DB-9 interfaces. All of our Fibre Channel cables are built to the Fibre Channel electrical interface specification and come with a lifetime warranty. For custom solutions contact: sales@elpeus.com. HSSDC to HSSDC cable. Adheres to strict industry specifications to ensure maximum performance and data integrity. 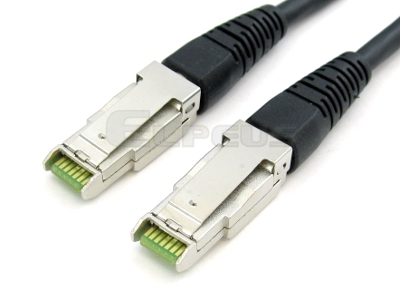 This cable provides high speed interconnect solution, the high Speed Serial Data Connector (HSSDC) used for transmitting data at rates exceeding 2.5 Gbit/sec. This new connector system was specially designed for use in copper implementation of Fibre Channel and other serial data applications which require extremely high data transfer rates over long distances. These HSSDC2 to SFP Cables adhere to strict industry specifications to ensure maximum performance and data integrity. These cables provide high speed interconnect solutions. 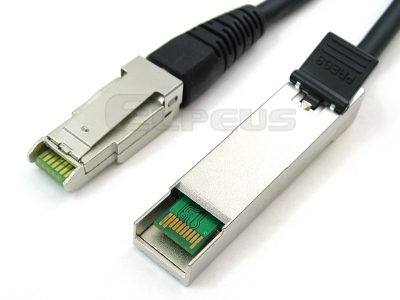 The high Speed Serial Data Connector (HSSDC) is used for transmitting data at rates exceeding 2.5 Gbit/sec. This new connector system was specially designed for use in copper implementation of Fibre Channel and other serial data applications which require extremely high data transfer rates over long distances. Fibre Channel HSSDC2 Loopback Modules are used for testing Fibre Channel ports, HBAs, and switches. These loopbacks are specifically keyed for Fibre Channel applications, and provides a cost effective method for port testing. The modules transmits data from the host electrically to the receiving data outputs and back to the host. Loopback modules for 1X InfiniBand applications are also available.